I’ve been traveling the past few days, visiting family and working, so I am not in those incredible Adirondack Mountains. The words from the homestead are ‘cold, damp and snowy.’ Apparently, it snowed last night in the High Peaks of the Adirondacks and the morning dawned clear and sunny, making for some pretty views. Today’s photo was taken this morning from the Adirondack Loj Road by sometime photographer and biologist, Ed. 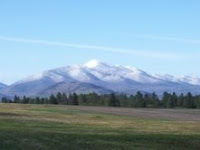 I also heard from a friend that the walkers at Pinebrook Farm in Lake Placid got an eye-candy treat of fresh snow on Algonquin and Marcy Mountains with bright, spring green fields in the foreground. I am down the shore now, enjoying the ocean and working. I am one of those people who just likes to be outdoors. I have a theory the ocean and beach eye-candy, nature experiences can be just as lovely as the mountains. The Adirondacks win today for views, but the shore has a nice feel to it. Spring at the beach can be neat.